Ginger is a well-known spice and food flavouring agent which has also been used in traditional Chinese, Indian and African medicine for thousands of years. Ginger is a time proven remedy for nausea, gas, and indigestion and is a potent source of valuable phytonutrients providing many health benefits which have been validated by modern science. Dating back to China from the 4th century B.C., the condiment is commonly found today in Asian food preparations and many desserts. It cleanses the colon, stimulates circulation, and reduces spasms and cramps. Modern clinical research indicates that Ginger may help in reducing the severity and duration of nausea and vomiting associated with both motion, travel sickness and pregnancy related sickness. An analysis of studies on its use during pregnancy and chemotherapy concluded that ginger is a safe, effective and inexpensive treatment for nausea and vomiting. Science has identified that the major benefits from ginger are derived from its active components known as gingerols. This has resulted in the development of ginger extracts which can be used by those wanting to receive the health and therapeutic benefits of ginger. 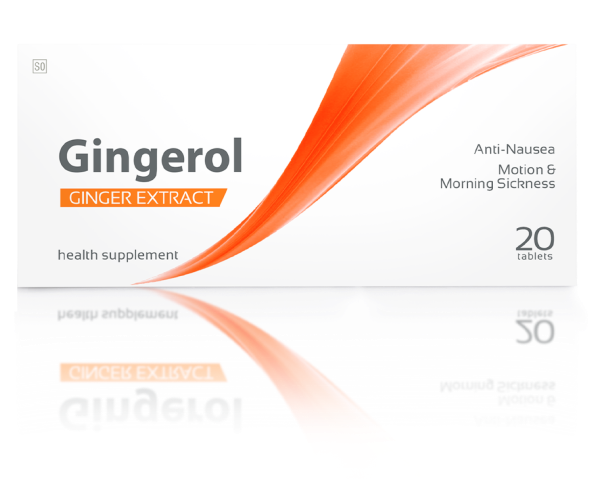 Gingerol® is a highly specialised ginger extract health supplement produced to the highest GMP standards for those wanting a safe, convenient and effective solution to the management of nausea as a result of pregnancy, motion sickness, illness or digestive disorder. One tablet up to 4 times daily. For motion sickness take two tablets 1 hour before travels. Do not exceed more than four tablets in a 24 hour period. If you are taking anti-coagulant or anti-platelet medication, or have a bleeding disorder, or any other medical condition consult your healthcare provider before taking Bio-Curcumin Advanced®. Store at or below 25degreesC.